Discover the results from the opening day of the Antalya Grand Prix 2018. Agadir Grand Prix silver medallist Catarina COSTA (POR) won her first IJF World Judo Tour gold medal with a convincing win over former Zagreb Grand Prix bronze medallist Fjolla KELMENDI (KOS) in the -48kg final. In the first final of the competition COSTA looked to employ her throwing skills against KELMENDI - the cousin of Olympic champion Majlinda KELMENDI - who was short of competition practice having not fought since the 2017 European Championships. With eight seconds left in a scoreless contest, COSTA shaped up for a morote-seoi-nage attack which was a prelude to a nicely disguised ko-uchi-gari for ippon. In the first semi-final Tbilisi Grand Prix winner Marusa STANGAR (SLO) fell to COSTA by two waza-ari scores. In the second semi-final KELMENDI defeated 17-year-old Cadet European Championships silver medallist Tamar MALCA (ISR) with a last-ditch ashi-waza attack for a waza-ari score. The first bronze medal contest was won by London 2012 Olympic champion Sarah MENEZES (BRA) who had the measure of Grand Prix newcomer MALCA from Israel. In the first medal contest at the Antalya Grand Prix 2018, MENEZES (BRA) won Grand Prix bronze for the second week in a row and is quickly returning to the -48kg elite since moving back down from -52kg. The Brazilian star scored a waza-ari on two separate occasions with her higly-effective ko-uchi-gari technique. The second bronze medal was won by 21-year-old world number 66 Gulkader SENTURK (TUR) in golden score as the hosts only had to wait until the second contest in the final block for a medal. SENTURK threw STANGAR with a tomoe-nage in golden score for a match and medal-winning score to break new ground on the IJF World Judo Tour. Paris Grand Slam bronze medallist Distria KRASNIQI (KOS) won her fourth Grand Prix gold medal with a tenacious display. World number five KRASNIQI, 22, defeated 21-year-old Chelsie GILES (GBR) in the -52kg final. GILES comes fromCoventry Judo Club, which also nurtured the talents of IJF Hall of Famer Neil ADAMS who is on commentary duty this weekend. The Briton was fighting in her sixth Grand Prix and captured her first medal with a bold performance. Kosovo won their first gold medal in this year’s event when the favourite scored two waza-ari without reply with the second coming just seconds before the end as GILES could not climb off an ippon seoi-nage. In the first semi-final KRASNIQI outlasted two-time Grand Prix winner Gulbadam BABAMURATOVA (TKM) who picked up her third shido with 65 seconds left on the clock in their scoreless contest. In the second semi-final GILES conquered Tashkent Grand Prix winner Betina TEMELKOVA (ISR) in golden score by a waza-ari score. 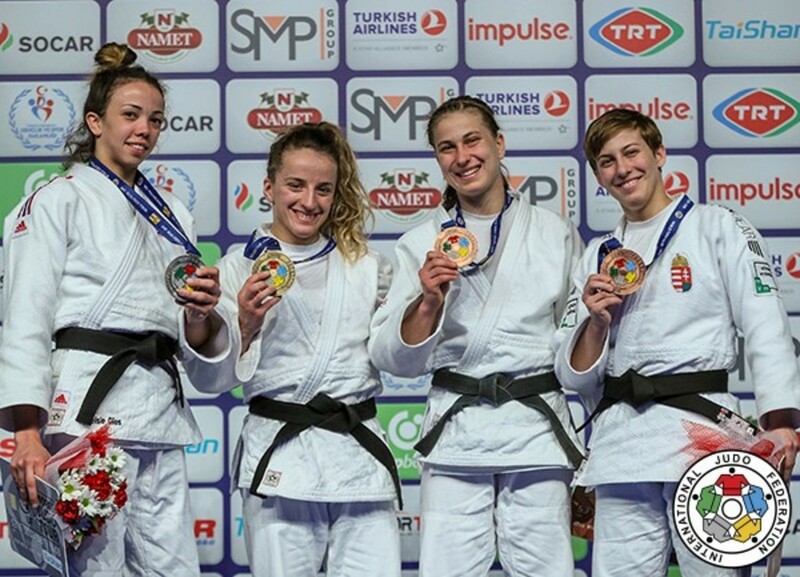 The first bronze medal was awarded to Tbilisi Grand Prix bronze medallist Anja STANGAR (SLO) who narrowly defeated TEMELKOVA for a spot on the -52kg podium by a waza-ari score. STANGAR switched from a ko-uchi-gari to a ko-soto-gari for the score as TEMELKOVA continues to suffer from a dip in form ahead of April’s European Championships in Israel. The second bronze medal was won by Zagreb Grand Prix silver medallist PUPP Reka (HUN) who tapped out Rio 2016 Olympian BABAMURATOVA with a juji-gatame for ippon. PUPP countered a koshi-guruma for a waza-ari and then secured the left arm of her opponent to force the submission. 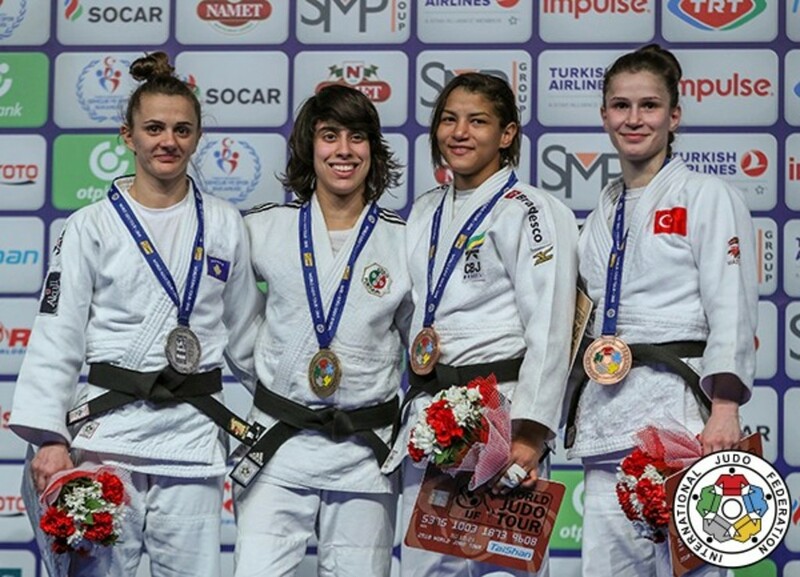 Tunis Grand Prix gold medallist Nora GJAKOVA (KOS) won her fourth Grand Prix title in the last 12 months by defeating the returning two-time World Judo Masters bronze medallist KIM Jandi (KOR) in the -57kg final. KIM fought only once last year as she earned a silver medal at the Hong Kong Asian Open in December and looked like a judoka who has been absent from the circuit as she exhibited a lack of match sharpness. In her third competition since Rio 2016, KIM squared off against an in-form GJAKOVA who countered an ouchi-gari for ippon with 43 seconds left on the clock. In the first semi-final GJAKOVA defeated two-time Pan American Championships bronze medallist Leilani AKIYAMA (USA) with 45 seconds left on the clock. Kosovo guaranteed their first medal of the competition when GJAKOVA threw AKIYAMA for a waza-ari and pinned down the American with a tate-shiho-gatame to advance to the final. In the second semi-final KIM bested former world bronze medallist Sabrina FILZMOSER (AUT) by the margin of two waza-ari scores to one. KIM countered an osoto-gari with an ouchi-gari for an opening waza-ari before the veteran Austrian restored level terms with a ura-nage. South Korea’s KIM booked her place in the final with a second ouchi-gari. The first bronze medal was won by FILZMOSER who illustrated her ne-waza prowess as the Austrian held down three-time Continental Open medallist Anna RIGHETTI (ITA) for ippon. FILZMOSER tangled RIGHETTI into knots on the ground to win and kick-start her Tokyo 2020 bid. 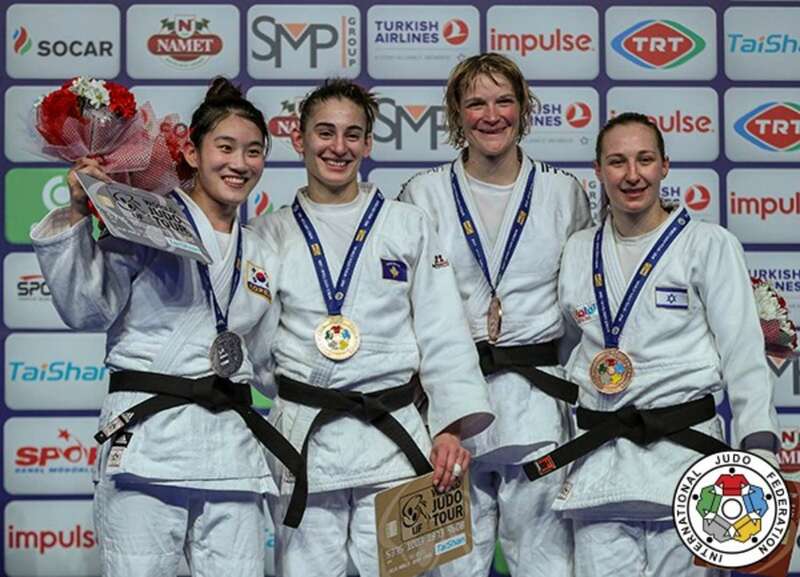 The second bronze medal was won by Belgrade European Open bronze medallist Maayan GREENBERG (ISR) who beat 21-time Grand Prix participant AKIYAMA. Grand Prix newcomer GREENBERG made a dream debut by throwing her American rival with 63 seconds left for ippon with a ura-nage as AKIYAMA came agonisingly close to making her IJF World Judo Tour breakthrough. Zagreb Grand Prix bronze medallist Albert OGUZOV (RUS) ruled the men’s lightest weight category to force his way into the plans of Ezio GAMBA for the remainder of Russia’s 2018 schedule. 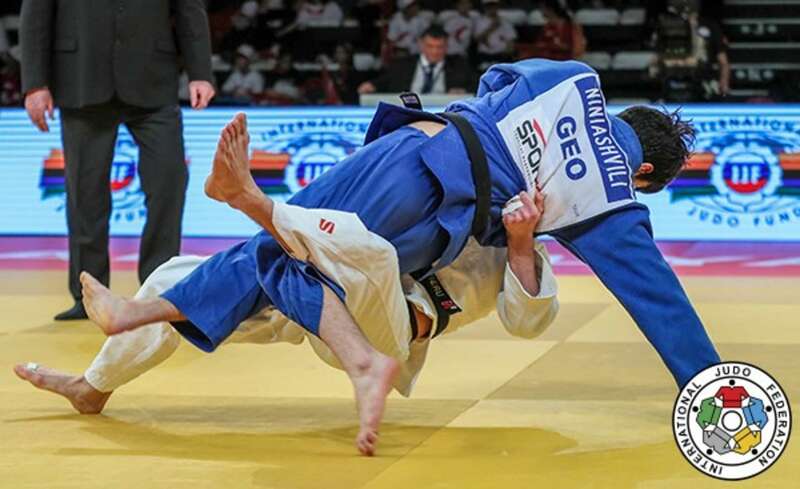 OGUZOV imposed himself from the outset in the final as 19-year-old Junior world champion Jaba PAPINASHVILI (GEO) was on the back foot and came undone on the ground. Ne-waza is not regarded as the forte of the Georgian team and OGUZOV delivered a ne-waza masterclass. The Russian seamlessly switched from shime-waza to a juji-gatame to secure the gold medal only 60 seconds into the final. In the first semi-final 21-year-old Junior World Championships bronze medallist JAGVARALDORJ Amarbold (MGL) lost out to PAPINASHVILI by two waza-ari scores as a young Georgian team were omnipresent in the men’s categories. In the second semi-final Grand Prix debutant Yerzhan YERENKAIYPOV (KAZ) was beaten by OGUZOV by a single waza-ari score in golden score. The first bronze medal was won by Pan American Championships bronze medallist Adonis DIAZ (USA) who caught YERENKAIYPOV with a picturesque yoko-tomoe-nage for a waza-ari score. DIAZ, 21, made sure that he is in the best position in his career ahead of the start of the Tokyo 2020 Olympic qualification phase in May. The world number 27 from America will now jump up the rankings and will be full of confidence at April’s Pan American Championships in Costa Rica. The second bronze medal went to JAGVARALDORJ after Junior Asian Championships winner YANG Yung Wei (TPE) was disqualified. YANG was ahead with a waza-ari score but was too eager to conclude the contest and received hansoku-make for a badly executed sode-tsurikomi-goshi which endangered the left arm of his opponent. Both judoka have pedigree in their home continent and could make the transition to success on the international stage in the Tokyo 2020 Olympic cycle. 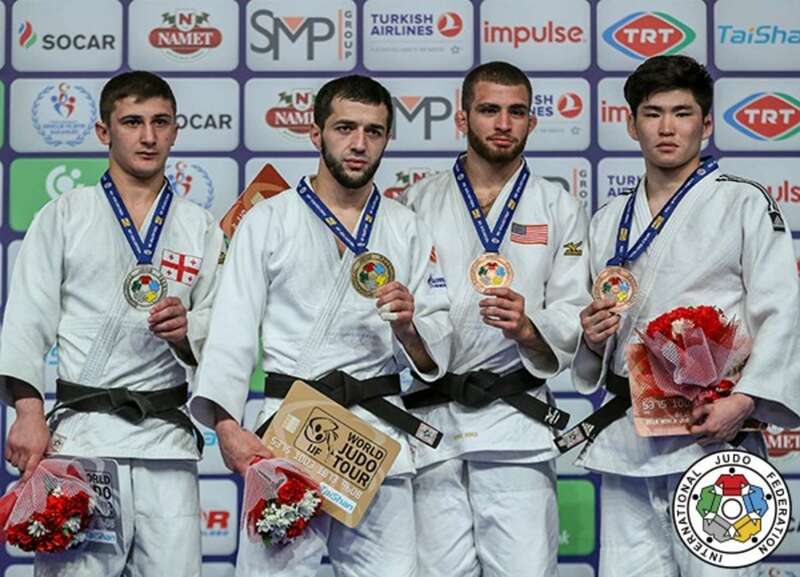 Junior World Championships bronze medallist Bagrati NINIASHVILI (GEO) struck gold at his first Grand Prix competition as Georgia unleashed their young charges in both men’s categories on the opening day. NINIASHVILI, 19, thwarted world number 24 Denis VIERU (MDA) as he showed his refreshing ne-waza ability to win for Georgia. VIERU overcommitted with a tani-otoshi attempt and NINIASHVILI anticipated it and forced the Moldovan down and into a hold to race to gold in 33 seconds. In the first semi-final World Judo Masters winner GANBOLD Kherlen (MGL) was stunned by VIERU who threw the Mongolian star with an ouchi-gari for ippon. In the second semi-final NINIASHVILI held down Zagreb Grand Prix bronze medallist Sinan SANDAL (TUR) for 20 seconds to book a place in the gold medal contest by ippon. 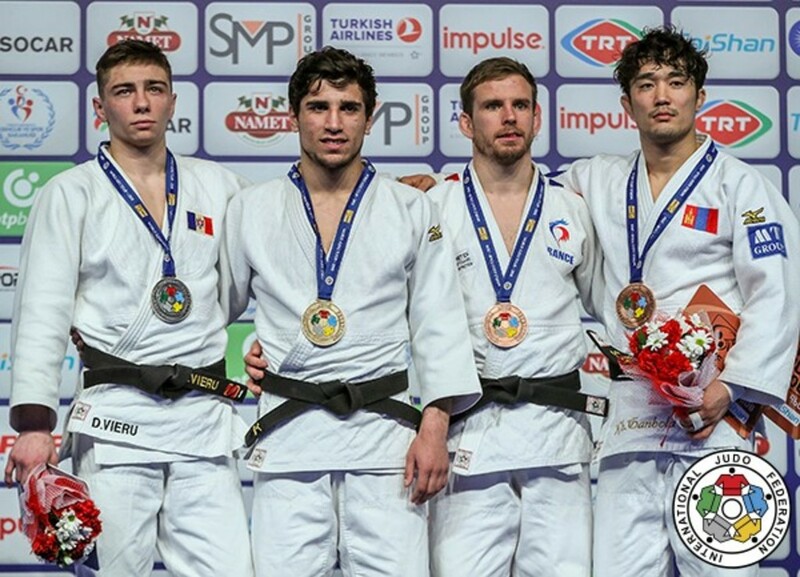 The first bronze medal was won by former Almaty Grand Prix bronze medallist Kilian LE BLOUCH (FRA) who tumbled SANDAL with nine seconds left with an ouchi-gari for ippon. LE BLOUCH, who has been selected for the European Championships next month, deflated the home atmosphere in the final seconds as Turkey missed out on a second medal on day one. The second bronze medal went to GANBOLD who lacked his usual vigour but had enough in reserve to defeat Yeldos ZHUMAKANOV (KAZ). GANBOLD bested the Kazakh courtesy of a single waza-ari score which came after the Mongolian set his rival off balance with just the threat of ashi-waza.